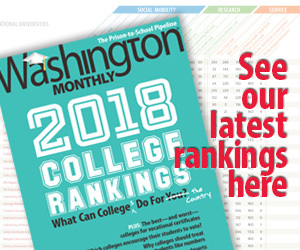 Washington Monthly | Will Recent Protests Affect Higher Education Leadership? Will Recent Protests Affect Higher Education Leadership? Over the last week, much attention in the higher education world has turned to the saga of University of Missouri-Columbia graduate student Jonathan Butler, who engaged in a hunger strike in an effort to get Missouri’s system president Timothy Wolfe to resign due to a perceived lack of attention paid to racism on at the Columbia campus. His effort quickly gained attention via social media, particularly when Mizzou’s football team decided over the weekend not to play any more games until Wolfe was removed. Wolfe resigned today in the face of overwhelming pressure (including from Republican legislators), handing the protesters a huge win. Wolfe’s speedy resignation clearly shows both the power of social media and the power of big-time college athletics. For example, Wolfe’s $459,000 salary was far less than the $1 million Mizzou would have had to pay Brigham Young University for cancelling the game, not to mention additional revenues Mizzou would have gained from a lucrative neutral-site game in Kansas City. It’s truly remarkable that arguably the two most influential college football programs of the decade are Northwestern (for its players’ attempt to unionize in recent years) and Mizzou—programs that have combined for zero conference championships since 2001. (1) Will the voices of students, faculty, staff, and the public in the presidential selection process change? One way to potentially avoid protests like in Missouri, Iowa, and North Carolina would be to give stakeholders a larger voice in the selection process of new leaders. These stakeholders often have a representative on the selection committee, but these committees are increasingly shielded from public view in order to keep candidates’ identities anonymous for as long as possible. Groups who are unhappy with current leadership may seek representation on the selection committees, which could improve the perceived legitimacy of presidential searches but result in a longer timeline for selecting new leaders. (3) Will future presidents demand financial protection against the risk of ouster? The typical tenure of a college president has fallen from 8.5 years in 2006 to 7 years in 2012 amid pressures from trustees, legislators, donors, and internal stakeholders. If the result of Wolfe’s ouster is additional resignation demands at other colleges, I would expect to see larger buyout packages placed into future presidents’ contracts in order to insulate leaders from the threat of losing their jobs. College football provides some good examples here, as a number of head coaches are being paid millions of dollars to simply go away. Although it is too early to tell whether protests at other colleges will result in leaders resigning or being forced out, the potential seems to be there if stakeholders coordinate their actions around a popular cause. But these conditions have existed at many colleges for decades, so it’s unclear whether Mizzou’s successful protests are a one-time success for protesters or a start of more ousters.